Like most people, you’ve no doubt experienced occasional dry mouth as when you’re thirsty or just waking from sleep. These are normal occurrences that usually don’t last long. But xerostomia or chronic dry mouth is another matter. Not only is this continual lack of adequate saliva uncomfortable, it could increase your risk for tooth decay or periodontal (gum) disease. What’s more, chronic dry mouth can have a number of causes. Here are 3 common causes and what you can do about them. Inadequate fluid intake. While this may seem obvious, it’s still common—you’re simply not consuming enough water. This deprives the salivary glands of adequate fluid to produce the necessary amount of saliva. If you’re regularly thirsty, you’ll need to increase the amount of water you drink during the day. Medications. More than 500 drugs, both over-the-counter and prescription, can cause dry mouth as a side effect. 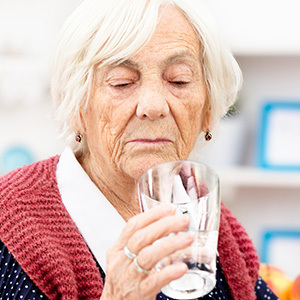 This is one reason why older adults, who on average take more medications, have increased problems with dry mouth. There are some things you can do: first, talk with your healthcare provider about alternative drugs for your condition that are less likely to cause dry mouth; drink more water right before taking your medication and right afterward; and increase your daily intake of water. Diseases and treatments. Some systemic diseases like diabetes or Parkinson’s disease can lead to xerostomia. Autoimmune conditions are especially problematic because the body may turn on its own tissues, the salivary glands being a common target. Radiation or chemotherapy treatments can also damage the glands and lead to decreased saliva production. If you have such a condition, talk with your healthcare provider about ways to protect your salivary glands. You can also ease dry mouth symptoms with saliva boosters like xylitol gum or medications that stimulate saliva production. Limit your intake of caffeinated drinks and sugary or acidic foods. And be sure you stay diligent with your oral hygiene habits and regular dental visits to further reduce your risks of dental disease.